Singapore is a City in a Garden – a perfect blend of skypscrapers and greenery. The National Parks Board (NParks) maintains Singapore’s green infrastructure, providing its scholars with the best opportunities and tools to embark on their own learning journey as they ensure that our Garden City continues to flourish. Singapore may be a bustling urban metropolis, but lush greenery and trees continue to line our roads and the island is dotted by several precious reserves of nature. The National Parks Board (NParks) is responsible for maintaining our green spaces, ensuring that Singapore remains truly a City in a Garden. 25-year-old Ong Chong Ren has been enamoured with nature since he was a young boy. His frequent visits to places like Sungei Buloh Wetland Reserve, MacRitchie Reservoir Park and the Singapore Botanic Gardens developed into an enduring interest in all things green. And after being dazzled by the stunning array of plants at one particularly memorable garden exhibition, Chong Ren decided to realise his passion in his own home, growing heliconias and orchards in his backyard. Chong Ren went on to apply for and receive the ,NParks Undergraduate Scholarship, which enabled him to pursue a Bachelor of Science with majors in Plant Science and Ecology & Evolution at the Australian National University, Australia. 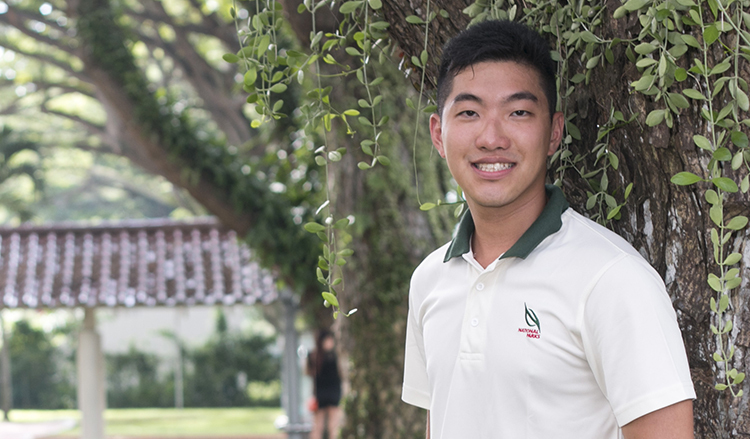 Chong Ren has enjoyed immense opportunities for growth since taking up the NParks scholarship. As a Manager (Streetscape), he is a part of various workgroups in NParks. He explains, “One such group is the Operations Productivity Workgroup. It is tasked to reduce labour and increase productivity in landscape operations and greenery maintainence, a particularly eye-opening experience for me.